The Times’ editorial board says that it’s unseemly for the Metro Board of Directors to name transit stations after members of the Board. “Is it really necessary to name stations after sitting board members? That has the appearance of legacy-building on the public dime,” writes the editorial board. The Board today as part of the consent calendar approved motions by Board Members Pam O’Connor and Ara Najarian to rename the North Hollywood Station the North Hollywood/Zev Yaroslavsky Station and to rename the East L.A. Civic Center Station the East L.A. Civic Center/Gloria Molina Station. The motions ask Metro staff to report back in January on how the changes will be implemented. Here is an earlier Source post about the renaming motions. A look at the pros and cons of allowing alcohol ads on public transit — something a few large agencies have embraces. The upside: much needed revenue. The downside: unlike other forms of ads, these type of ads can be hard to tune out for a captive audience, meaning young riders are exposed to them for longer periods of time. Metro, by the way, prohibits advertising for alcohol and tobacco products. Read Metro’s advertising guidelines here. The first high-speed train rolled between Tokyo and Osaka 50 years ago — and a little more than 19 years after the end of World War II. Eight other countries today have bullet trains. The United States isn’t one of them. Officials from several Western states gathered in Salt Lake to discuss the best way to stay in the high-speed rail game. Their verdict: support California’s bullet train efforts because if things go well here, high-speed rail could spread to surrounding states. Time travel oriented readers should set their DeLoreans for the year 2114 to see if the L.A.-Las Vegas-Salt Lake line has been built along Interstate 15 along with a leg along Interstate 80 connecting to Denver. Such a train would be a great way to reach some good skiing…if, in fact, there’s still skiing to be had in a potentially far warmer world. 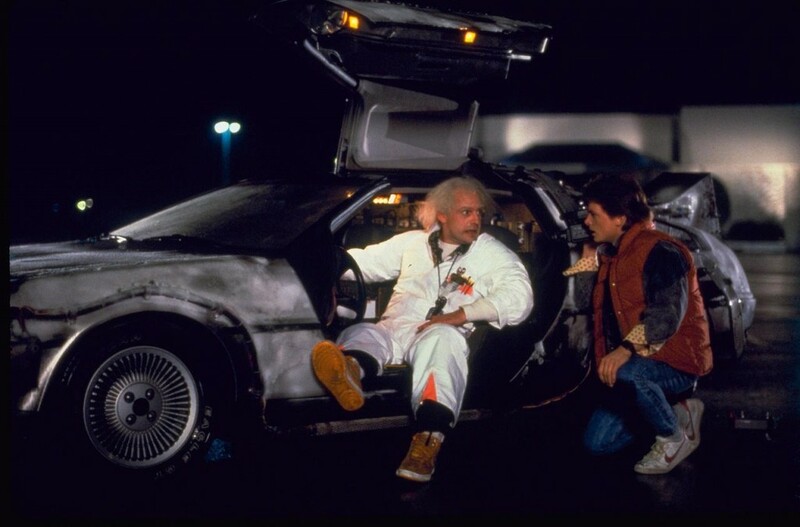 Curious minds want Marty McFly and Professor Emmett Brown to check the status of high-speed rail in 2114. The Finnish city has committed to a concept called “mobility on demand,” in which a wide range of transportation options from buses to driverless cars to bikes would be meshed together into one system that a person could use to order any trip on a smartphone. The passenger would need to enter just an origin and a destination, and the mobile app at the heart of the program would do the rest, selecting the most appropriate modes of transportation and mapping the best route based on real-time traffic data. Everything would be covered through one payment plan, either through a monthly charge, like the taxi service Uber, or a pay-as-you-go option. Users would be able to monitor their costs and adjust how they use different means of getting around. The plan offers door-to-door service that would eliminate the first-mile and last-mile complications of getting to and from public transit. Now that’s thinking big! Will it work? Depends, I suppose, on how willing people are to give up their cars — something that likely depends on how convenient other options are. Please read the entire article that goes on to explain the success of a small bus that people can order on demand and use to customize their transit trips. UPDATE: I included this story at the top of an earlier version of the headlines, not realizing that the story was originally published in June 2013. Instead of deleting, I moved the item to the bottom of the headlines. Measuring traffic from Imperial Highway to Getty Center Drive, the company found that drive times have been reduced by 20 minutes at 3 p.m., 9 minutes at 4 p.m. and 5 minutes at 5 p.m. INRIX is comparing May, 2012 to May 2013 here. Not bad. As you likely know, the I-405 Sepulveda Pass Improvements Project, added a northbound HOV lane to the 405 between the 10 and 101 freeways. The lane opened this spring and most work on the project is now complete. Inrix also found that traffic has worsened 11 percent in the L.A. area and that the commute on the eastbound Santa Monica Freeway has significantly taken a turn for the worse. Does that echo your experiences, readers? Aaargh. Thanks much for heads up. I moved item to the bottom and added a note saying it’s a year-old story. Someone sent me link and I dumbly didn’t notice the date of publication. Thanks again! A INREX study found that commute times have improved on the 405 freeway since the upgrade. It also showed travel on the Westside including the Santa Monica Freeway has taken a 11% turn for the worse. It’s all to apparent that we need relief ASAP. Much of the east-west major traveled streets at one time had rail mass transit but was removed by both private operators and the old MTA. Santa Monica Bl. had much of the old right of way intact but from Century City west to the 405 freeway was removed including the bridge over Beverly Glen by the MTA. It’s time for a light rail line to be built first along Santa Monica Bl. from at least the 405 freeway east to Silverlake or Downtown L. A. Said construction should be performed by a company like Railtex which is geared toward rapid construction techniques as opposed to the slow construction methods we see today on both the Gold Line and Expo Line. Again I will point out that it took the Los Angeles County Transportation Commission, a predecessor agency to the MTA, over three years to build the Blue Line over the same right of way that the Pacific Electric used. It took Henry Huntington six months to build it originally in the early 1900’s. It would seem modern technology would result in a more rapid method of construction but what we see is it taking six times as long to perform the same task. Easy explanation. Safety measures and shorter workdays are part of the reason. Other reasons include the fact that the Blue Line has much more infrastructure and was built in a city versus being built mostly in open fields. The Blue Line is built on the same right of way. It makes no difference if it’s rural or city. And the main reason Huntington was able to build it in six months was because he used multiple crews working from each end and throughout the line simultaneously as opposed to starting at one end and working to the other end with one crew as is the practice now. Read up on the BNSF latest project adding another track over Cajon Pass. It’s quite impressive and shows what professionals can accomplish. According to the book “Henry Huntington and the Pacific Electric” by Spencer Crump; in 1911, the Long Beach Line Limited Interurban Trains took 36 minutes to go from Sixth and Main in Downtown Los Angeles to Ocean and Pacific in Long Beach. The Local Interurban trains took 40 minuted to make the trip. By 1954, the limited trains took 60 minutes to make the same trip according to the same source. No timetable is given for locals. A 2012 Metro Blue line timetable shows an average trip from 7th Street Metro Center to Long Beach Transit Mall takes 58 minutes. It is obvous that the trains ran very fast in 1911 but had to slow down over time. What this suggests is that most of the route of the Long Beach Line was open countryside in 1911, but went through a rapid urbanization in the next 40+ years. More grade crossings, stop lights, and what have you mandated slower train speeds. Henry Huntington built his P.E. almost entirely in open countryside on right of way and land he had purchased or had right to build on. Construction methods and standards in the 1900’s were simpler compared to the 1980’s, let alone today. Needless to say, regulatory oversight was far greater in the 1980’s than they were in the 1900’s. Also people have beome more litigious in recent times. What Henry Huntington could get away with in 1900 would be impossible in the 1980’s. No one still hasn’t explained why multiple crews are not used today to expedite construction. It’s not unsafe or unlawful nor could it result in lawsuits. Also why can the major railroads and their contractors construct new lines and upgrade existing lines no matter where in less time? That 405 traffic LA Weekly article is from June 27, 2013. Metro, you’ve lost my vote for any new tax increases dealing with Metro plans. At least you aren’t living in a county where the Board of Supervisors tore down a perfectly usable, historic air terminal building named after the county aviation pioneer who’d started the airport, in order to build a terminal many times its size, named after a sitting member of that board. Compared to a huge (and completely unnecessary) eyesore of an airline terminal building, trolley and subway stops are small potatoes! If you think it’s “small potatoes,” feel free to write the check payable to Metro for the cost that will be incurred for station renamings. Naming stations after living, current politicians is against Metro’s station naming policy and what they just did was violate their own rules. Basically, that sets a precedent to politicians: they can write the rules and they are free to break the rules when it benefits them because they are the ruling class. Everyone else is a peasant. Just stop naming them after anyone. Who really cares anyway. Just name them for their location; i.e. Hollywood/Western; Imperial Station. The I-10 / I-405 traffic situation is made worse by Metro’s Blind Eye to developing near term, north – south alternatives to the I-405. West of La Brea, we get one pathetic CC local bus on Sepulveda from UCLA to LAX, and two S.R.O. local/express BBB lines down Lincoln to LAX. How about an express bus service study and trial for a route from UCLA to Del Amo center via LAX. Today it is impractical (severe understatement) to use public transit to get from the South Bay to the Westside much less further north. I’ll be long dead before the Purple Line reaches SM and (maybe) turns south. I believe the 761 or it’s previous line number went from the valley to LAX via Westwood but was cut back. The same is true for the 220 line. It used to go from West Hollywood to LAX including the West Imperial Terminal and the Marina. It now Runs from Cedars- Siani Hospital to Venice BL/ Expo Line. Not only the SM fwy eastbound, but every eastbound street is gridlocked after about 4 pm every week day west of the 405. The best way to get out of Santa Monica is Main St. Then take Rose/Palms, or Venice eastbound. It begs the question that whatever happened to traffic control? People are making southbound turns on Sepulveda, and blocking the intersection so no one can continue eastbound on SM Blvd, Olympic, and Pico. I’m just counting the days for when the Expo Line gets through. A couple of things I’ve noticed about the SM fwy eastbound. The 405 southbound connector is only one lane. Traffic backs up for miles as people try to get over two three lanes to make the transition. This has a ripple effect that slows traffic down to a crawl all the way back to Lincoln Blvd. It even happens in the middle of the day. So they supposedly did great things for traffic flow on the 405, but forgot about this one bottleneck. It’s possible they made it worse. Another thing is drivers generally don’t know how to merge with freeway traffic. Most of the time people actually slow down on an entrance ramp. There’s something seriously wrong with traffic flow on the eastbound SM fwy. What to do? City administrators are obviously not driving the streets. It’s just like the metro administrators. C’mon guys, get on the buses and trains, and then make policy.